Sister Aisya's Telescope: Nabawi Mosque in Madinah, 2007. Islamic New Year - 1 Muharam 1428H / 20 Jan 2007 CE. Picture taken from 12th story of Movenpick Hotel. Hahnemann's staff room. We had just finished the doa for beginning of the year 1428H. Can see the people waiting for Ishak (the 5th prayer of the day) right outside the mosque. 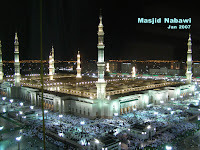 This holy mosque in Madinah, is the mosque of Muhammad (s.a.w), the Messenger of Allah. I have added the Mosque name and year. Welcome to download this for your computer's wallpaper.